Combined Maritime Forces (CMF) Director Operations, Capt. 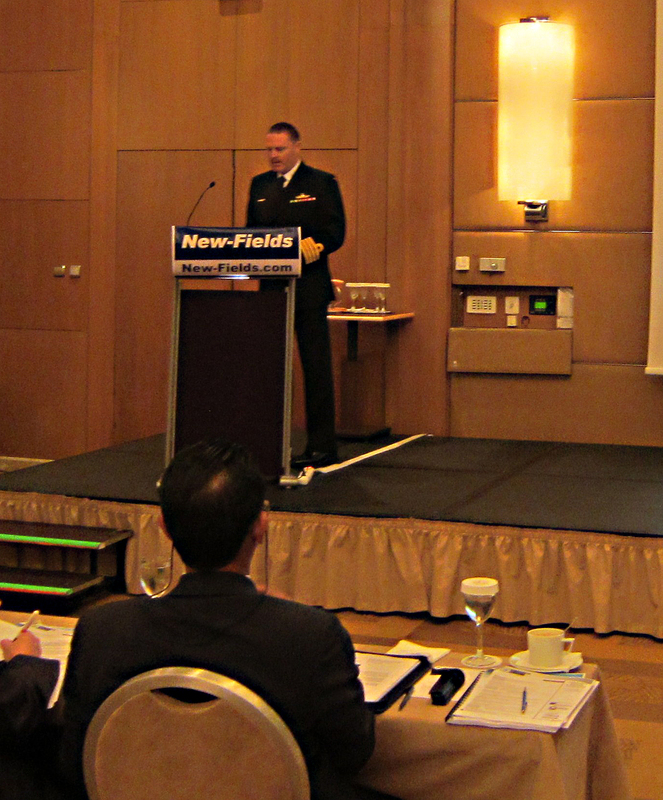 Bruce Legge, Royal Australian Navy attended the 3rd Maritime Security & Anti-Piracy Conference, in Athens, Greece, Mar. 7-9. Capt. Bruce Legge Royal Australian Navy, Director of Operations Combined Maritime Forces, addresses delegates at the 3rd Maritime Security and Anti-Piracy Conference, Athens, Greece. The three day conference was attended by those associated with maritime security operations, principally Somali piracy. Divided into sessions, the guest presenters discussed the many issues associated with piracy. Topics included the role of international law; the human cost of piracy attacks and the need for an international industry response; counter-piracy strategies and allied counter-piracy operational cooperation, as well as adherence to Best Management Practises 4. Legge addressed the conference with a counter-piracy operations update from Combined Maritime Forces, providing current Somali piracy statistics and trends as well as an update on the Shared Awareness and Deconfliction (SHADE) forum. He also gave examples of successful disruptions and coordinated responses by naval assets in the area. Other presenters included a keynote address given by Commodore Bruce Belliveau, Royal Canadian Navy, Deputy Chief of Staff Operations, NATO Maritime Command. The naval presentations were well received and produced some considerable debate during the session’s panel discussion. “Not everyone involved in shipping in the vicinity of the Gulf of Aden and Indian Ocean understands what the military assets are doing, and are able to provide. So this conference provided an excellent opportunity to share knowledge and experiences”, commented Legge. Other issues discussed were the use of ship’s citadels, privately contracted armed security personnel in ships and the prosecution of arrested suspected pirates. The most chilling discussions were those in which the plight of captured merchant sailors was illustrated. “The human face of those sailors held captive for long periods of time and the stress to their family’s is something no one should lose sight off when considering the maritime piracy conundrum” said Legge.